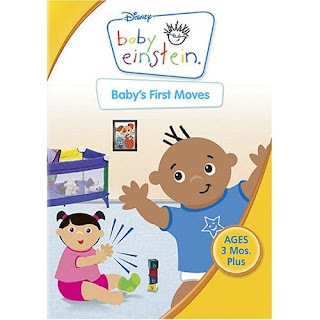 When MomCentral asked if I'd like to review Baby's First Moves by Baby Einstein, I was happy to see what new things have come out since the boys were tiny. When C was an infant, I remember getting ready for work in the morning while he played in his exersaucer and watched the early Baby Einstein videos. I also remember how helpful they were when I was suffering through my 1st trimester with N, and then later when N liked to breastfeed for hours at a time! I have fond memories of the time spent watching quite a few of these videos over the years with the boys. We received a copy of First Moves, which I hadn't seen before. The boys were eager to share the fun of Baby Einstein with their sister. They remembered the puppet shows and were looking forward to laughing along with L.
This dvd follows the same format as the other Baby Einstein videos we've watched. There were silly puppet shows, soothing music, babies and kids, toys and live animals. The concept is simple, but enjoyable for young children. I love the fact that they have always been referred to as "digital board books," because that's exactly what they are like -- except with music! There's no storyline, so it's easy to keep up your own running commentary with your baby about what's on the screen. L (10 months) really wasn't very interested in watching the screen. She was much more interested in watching the boys, which is typical for her. We all sat together on the floor and moved along with the babies on the screen. Personally, I think she'll be more interested in a few months. I think this is something to definitely put on in the background while playing in the living room. It is gentle and simple. One of the bonus features is a pilates instructor (and mom) showing some exercises that you can do with an infant. The emphasis is on interacting with your infant, while still doing something for yourself. The exercises she showed were simple and definitely do-able. I think these dvds are especially great for first-time parents. When you're a new parent, it's easy to feel that you don't know what to do, or that you're not doing enough. These dvds give you another outlet to interact with your baby, and are a nice diversion to have for older toddlers. While this dvd is rated for ages 3 months and up, I think kids between 1 and 2 years old would enjoy it most. The mom exercise section is definitely for moms with infants. Baby Einstein has always encouraged interacting with your child and their videos. They encourage conversation, movement and introduction of new things. When my boys were little, I remember they loved to watch the bugs on some of the videos, and they learned quite a few animals from the animal videos. We often use videos to reinforce concepts and help learn new things, and I consider these fun for the toddler group. I know Baby Einstein started an early love for puppets that my boys still have! The Baby Einstein website has definitely evolved over the last decade! Check it out for information about all their products, as well as tips and ideas for baby development.